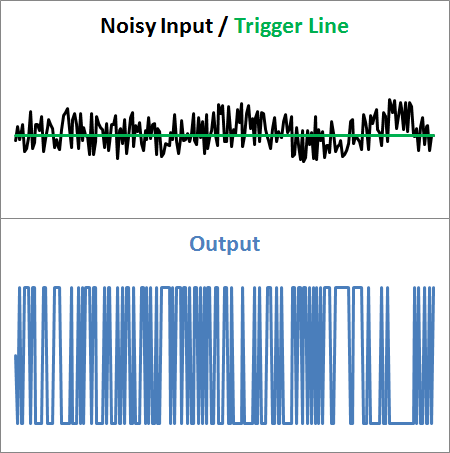 At long last, I’ve released an Autotune Library to compliment the Arduino PID Library. When I released the current version of the PID Library, I did an insanely extensive series of posts to get people comfortable with what was going on inside. While not nearly as in-depth, that’s the goal of this post. I’ll explain what the Autotune Library is trying to accomplish, and how it goes about its business. For A couple years I’ve wanted to have an Autotune Library, but due to an agreement with my employer, I wasn’t able to write one. BUT! when I found the AutotunerPID Toolkit by William Spinelli I was good to go; My company had no problem with me porting and augmenting and existing open source project. I converted the code from matlab, made some tweaks to the peak identification code, and switched it from the Standard form (Kc, Ti, Td) to the Ideal form (Kp, Ki, Kd.) Other than that, all credit goes to Mr. Spinelli. 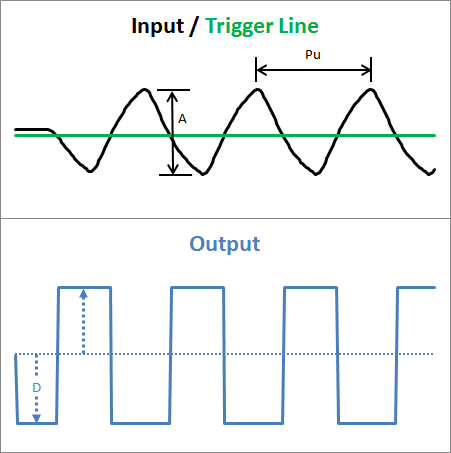 The best tuning parameters (Kp, Ki, Kd,) for a PID controller are going to depend on what that controller is driving. The best tunings for a toaster oven are going to be different than the best tunings for a sous-vide cooker. Autotuners attempt to figure out the nature of what the controller is driving, then back-calculate tuning parameters from that. There are various methods of doing this, but most involve changing the PID Output in some way then observing how the Input responds. Starting at steady state (both Input and Output are steady,) the Output is stepped in one direction by some distance D. When the Input crosses a trigger line, the output changes to the other direction by distance D.
This works well in theory, but real-world data isn’t very cooperative. 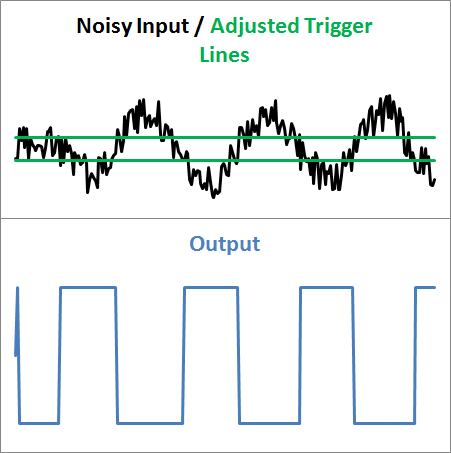 The input signal is usually noisy, which causes two main problems. Problem #1: When to step? The way I chose to side-step this issue was to have the user specify a noise band. In effect, this creates two trigger lines. Since the distance between them is equal to the noise (if properly set) it’s less likely that multiple crossings will occur due to signal chatter. Every noise blip is a direction change. To deal with this issue I added a “look-back time” parameter. It’s an awful name. If you can think of something better let me know. At any rate, the user defines some window, say 10 seconds. The Library then compares the current point to the last ten seconds of data. If it is a min or a max, it gets flagged as a possible peak. When the flagged point switches from being a max to a min, or vice versa, the previously flagged point is confirmed as a peak. 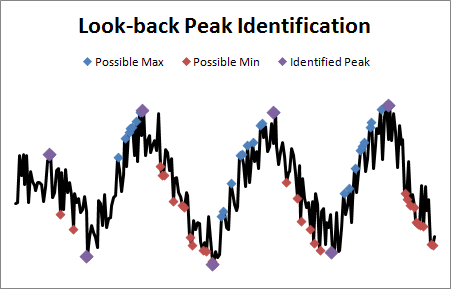 Another way of explaining the look-back time is that a point will be identified as a peak if it is the largest (or smallest) value within one look-back into the future or past. Like I said: awful name. I’m not the biggest fan of Autotune. I’ve often said, and still believe, that a moderately trained person will beat an Autotuner every day of the week. There’s just so much that can go wrong without the algorithm knowing about it. That being said, Autotune is a valuable tool to help the novice get into the ballpark. This entry was posted on Saturday, January 28th, 2012 at 2:41 pm	and is filed under Coding, PID. You can follow any responses to this entry through the RSS 2.0 feed. You can leave a response, or trackback from your own site. I think I’ve learned more useful stuff from your half-a-dozen blog posts than I did last year in two quarters of MechE controls classes at the university. They just refuse to talk about inconveniences like actual real-world data. You wouldn’t happen to know about some outstanding textbook on the subject? My Controls text by Nise is pretty useless when you try to actually do anything with it. Yeah I got lucky in college. My controls professor didn’t talk about laplace transforms until near the end of the semester, preferring to teach us using real world simulations. Hands down the reason I’m a controls engineer today. You’ll want to read his entire website: http://controlguru.com/ It’s formatted like it’s 2004, but it’s solid gold. If you think you’re learning something from me, that site will be like superfly TNT. i learn from this blog very much!!! i have translated this veryyyyyyyyyyyyyyyyyyyyyy good blog!! KU = 4 * D / A*PI (why???) may be i can find the answer from matlab source!!! i forgot how to use matlab. in my collage, i use this magic math tools . but when i go to work. i forgot how to use matlab anymore. Sorry for my bad English but I have few questions for you. I’ve read your posts on the PID library (Improving the Beginner’s PID) and found them really resourceful! I have a question regarding the implementation of the PID Autotune though. First off, I’m no expert at programming. I am trying to use the PID Autotune to control the hovering of my quadcopter. The thing is, I don’t know what Kp, Ki and Kd values to use for the control. Long story short, when I use the Autotune library and its functions, is it necessary for me to initialise the Kp, Ki and Kd values? I don’t know what the values should be though. And it cannot be any value, right? Hi Brett. I love your projects and blog. A couple of comments. Looks like the default value for the hysteresis in the library is beta = 0.5/30 = 0.016. Am I right in thinking that is pretty aggressive? Would it be a good idea to use some kind of low pass filter on the measurements? The better to estimate period and amplitude free of noise. OK, I might try porting a little bit more of the original MATLAB code. I forked the code and added some stuff. I’m afraid I don’t really know how to use Github so I hope I didn’t mess up. @tom dither! neat. one thing: on the .h you have SetDither(double), but in the cpp it’s an int. I’m surprised that compiled for you. I also see you put it some of the additional tuning correlations. also cool! can’t wait to see what else you add! Figured I need the dither because I am measuring using a DS18B20 accurate to about 0.1 oC and it tends to hunt around the set temperature. I’ve added some similar code to the PID library. I am looking at coding low pass filters for the input (to avoid aliasing) and the derivative (to limit gain). i think you could write a book on pid ! i have actually decided to stick with arduino as a hardware platform because this library is so good. can the code be ported to netduino or gadgeteer ? Hi, Thanks for this great code. Question: Wont the following code run off the end of the lastInputs Array? nLookBack could potentially be 100, in which case ‘i’ starts at 99, the end of the array, only for lastInputs to eventually be updated. I would think the array should be declared of size 101 to fix this, yes? Oh cool. It was a bug– My programming isnt as rusty as I thought. I ask this because in my system, for reasons that aren’t necessary to explain here, the first cycle always has a lot of ‘momentum’ and thus the first peak is always extremely high, and then all subsequent peaks are roughly the same height. When the algorithm eventually finishes on the 3rd peak, it uses an AbsMax that came from the first peak/first cycle and was thus extremely high. It would seem that for me, my “AbsMax-AbsMin” in FinishUp() would be too large. Would you say that it would be more correct to compute an AbsMax and AbsMin after the algo is done, based on the final 2 peaks and troughs? Do you think running a analysis of a series of step functions is more accurate than this method (especially with an asymmetric ‘A’ value)? I’m happy to add to the code library but just looking for your opinion on the matter. @Nigholas, Autotuning isn’t really my area of expertise so I don’t think I can speak with any authority on that. how would you analyze the data? if this is to be run on a microprocessor, doing regressive models or something might be a bit computationally intensive.